Is Quickley Cats’ answer at the point? Louisville Moore High School defensive end J.J. Weaver could help UK next season because of his explosiveness. If you want to know how good Louisville Moore defensive end/ linebacker J.J. Weaver is, let Western Hills receiver Wandale Robinson explain. Weaver, also a four-star player, joined Robinson as a University of Kentucky football commitment last week. Now they will be teammates again like they were for three years in middle school when they played on an all-star football team together. Josh Edwards, recruiting writer for The Cats Pause/247, believes Weaver could make an impact at Kentucky in 2019. Jeri Maas has a son who is a senior at Moore and she has watched Weaver play numerous times. She shares Edwards’s opinion about Weaver’s personality. “I have seen Maxey play a lot. He is one of the best combo guards I have ever seen, especially in that 2019 class. Really explosive. He plays with rhythm and flow. He will be a good fit for Kentucky,” said Harmon, one of the topranked point guards in the 2021 recruiting class. Harmon has played both with and against Whitney, who will sign with UK in April. Nice to see both tight end C.J. Conrad and cornerback Derrick Baity get an invitation to play in the East-West Shrine Game Jan. 19 at 3 p.m. in St. Petersburg, Fla. The game will be shown live on the NFL Network. Baity became a shutdown defender for UK this year by dramatically improving his technique, according to UK coach Mark Stoops. He has 34 tackles; seven pass breakups, one interception and one forced fumble. Safety Mike Edwards, linebacker Jordan Jones and Snell are also considered likely NFL draft picks. “You’ve got to find a way to win the game in difficult situations and overcome it, adversity and bad plays, and getting nine is a big deal. It hasn’t been done in 41 years and that is significant. They deserve some recognition because they’ve worked hard,” Stoops said. 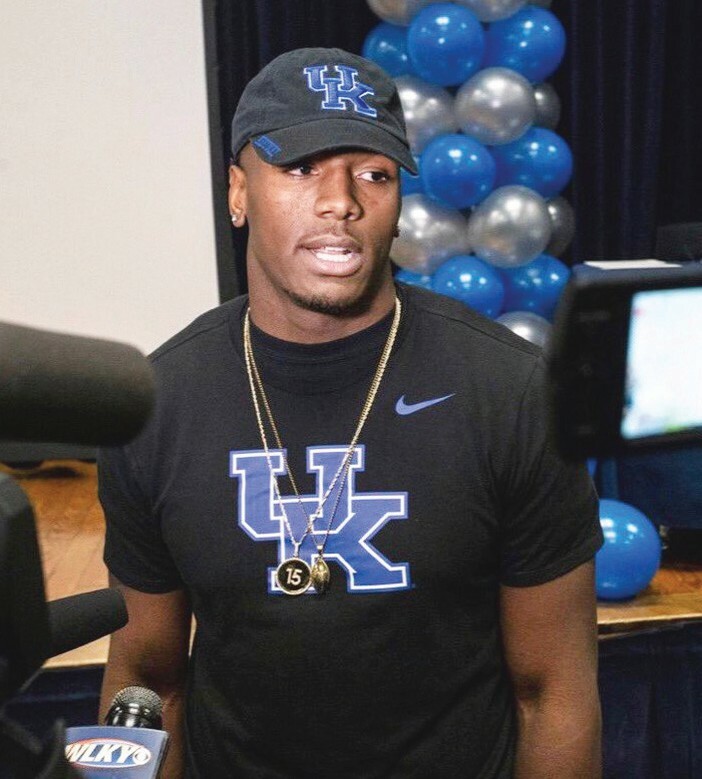 Rombaugh said Jeffries simply wanted to check other options when he de-committed and then Kentucky coaches opted to look at other options rather than continue to recruit him. “He played for Penny (in AAU). It wasn’t that DJ didn’t like Calipari or Kentucky. It was just a situation where he was doing what was best for him. Basketball is a small percentage of college. What’s he going to do rest of day, what’s he doing to do at night, who does he hang out with. “We always feel like there is room for improvement and we are going to strive for that. I don’t take it for granted either. I appreciate the work that was put in for a long time. Just staying consistent and steady, continuing to work and build. We have some great people around here and going to continue to strive to do better,” Stoops said. “You hear 10, it’s signifi- cant. And every win — we only get so many opportunities, so, it’s very important. I felt like we really did some things differently from a year ago. The guys played really hard and we gave it a great effort, and we’re going to do the same thing this year. Quote of the Week: “I didn’t ask, and I didn’t care. Once they said that we were the ones they chose, I’m good. Let’s move on. Be thankful and move on. So we’re glad that they picked Kentucky. I would like to think it wasn’t that close. They had a choice. And the fact that they chose our guys and our fans means a lot to us as a department. So whatever it was, their process, I’m thankful,” UK athletics director Mitch Barnhart on UK’s berth in the Citrus Bowl Jan. 1 in Orlando. Quote of the Week 2: “Those are two of the top, consistently good, powerhouse teams and I’m not going to lie — Minnesota is a really tough place to play. It’s a scary gym. Not being in the Big Ten seeing that every night, I’m not sure how they are going to face them. I wish them good luck, but I am going to be rooting for the Big Ten,” Purdue’s Blake Mohler on UK after playing to play Nebraska and then maybe Minnesota in Minnesota in the NCAA Volleyball Tournament this weekend.